As organizations are taking full advantage of digitization and cloud applications for the rapid growth. Companies are working hard to improve defenses, But still despite of these securities, organizations are being victim of data breaches, email scams, and other cyber attacks frequently. A recent FICO servery shows “Indian Firms are Overly Confident about Their Cybersecurity”. To discuss more on cyber security challenges, In an exclusive discussion with Sanjit Chatterjee, CEO, REVE Antivirus discusses the cyber security challenges for The Indian Organizations. CXOVoice: What are the Major Causes of Cyber Security Attacks Today? Sanjit Chatterjee: Failure to deploy correct endpoint and network solutions, not keeping the software updated and not monitoring user behavior are some primary reasons behind cyber security attacks today. To tackle the cyber security challenges, It is important for organizations to identify the areas of vulnerabilities, understanding the tools and mechanisms used to exploit these vulnerabilities and the resulting impact of the cyber attack. One should be trained enough to distinguish an authentic communication from the malicious one. CXOVoice: Are those Companies In Pure Risk, Who are Moving Everything on Cloud? Sanjit Chatterjee: Though the risks associated with cloud are going to get more critical with time, but there are solutions available to mitigate these risks. Not moving to cloud is certainly not an option these days. Companies considering migrating to cloud will have to ensure that they are using the right type of security solutions. CXOVoice: What are the Factors Driving Cyber Security Challenges? 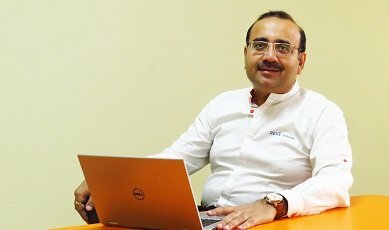 Sanjit Chatterjee: Attackers these days are now more sophisticated in their attacking techniques; we even see a lot of freelancers indulging in phishing and ransomware attacks as it has become a luring market. Also, ignorance of the users when it comes to cyber security is certainly not a bliss. Even the companies are not paying the required amount of attention to this domain. CXOVoice: FICO Survey Says Indian Companies are Over Confident About their Cyber Security, What do You Say? Sanjit Chatterjee: The rapid digitization in India has certainly led to increase in industry awareness and spends in security, but so is the sophistication level of the attackers. Companies need to be more realistic and robust in their cyber security assessment. An “always” alert mode is the need of the hour. CXOVoice: Adopting Latest Security Applications are Enough to be Sure, you are safe? Sanjit Chatterjee: Security services such as antivirus, endpoint security solutions, etc. provide state-of-the-art protection, however, even the most advanced security applications can leave an organization vulnerable to malicious attacks. An organization need to ensure that the security tools are deployed and used properly. Trained manpower and involvement of top management are another aspects that companies need to look into. Since cyber security challenges and threats are evolving, our defenses need to advance as well. CXOVoice: To Protect Organizations Security, what are your Recommendations for the Companies? Sanjit Chatterjee: Financial information, private details of the employees and customers, etc. are the key assets that criminals seek to benefit from. To combat this, companies need to create a cyber security culture at work. Formulating and implementing a cyber security policy and ensuring a periodical review by top management would add to the safety of the company. Employees must be trained enough to understand their obligations, risks and implications in the event of a cyber breach. CXOVoice: What are the Major Risk Associated with Cloud Computing? Sanjit Chatterjee: While the global cloud computing market is expected to reach $191 by the year 2020, Data Security still remains a key concern when it comes to adopting cloud. There could be a leakage, loss of visibility or control and unauthorised access to data when it is on the cloud. Depending on the type of data and extent of breach, the outage can be devastating enough to shut down a business’ doors.